Without Smart Previews, you can only process photos in the Lightroom Develop module if the hard drive containing your photo files is connected to your computer. If you store your photos on an external hard drive, and it isn’t connected, you can’t process them. This is unlikely to be a problem if you do all your photo processing at home. But it’s a disadvantage when you travel. You may prefer not to take a hard drive containing photo files with you in case it gets lost or stolen. Or you might leave external drives at home so you travel with fewer items. 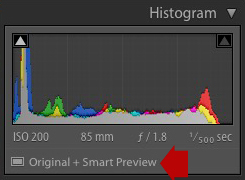 In Lightroom 5 Adobe introduced a new feature called Smart Previews that solves this problem. A Smart Preview is copy of a photo file. It is a compressed, lossy DNG file that has been resized so the longest edge measures 2540 pixels. 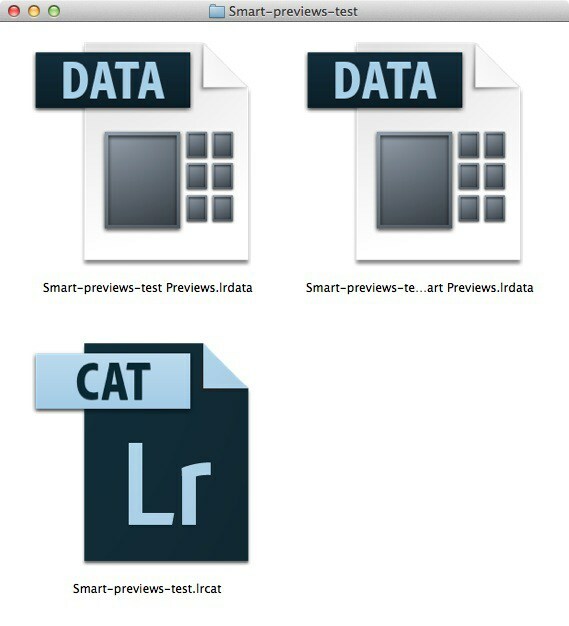 It is saved, along with all other Smart Previews belonging to the same Catalog, in an .lrdata file. The .lrdata file type is also used to store the previews that Lightroom makes so it can display thumbnails and full-size previews of the photos displayed in the Catalog in the Library module (Minimal, Standard and 1:1 previews). Both .lrdata files are saved in the same folder as the Catalog (which should be on your computer’s internal hard drive). Here’s the folder showing the Catalog file and the accompanying .lrdata previews and Smart Previews files. There are three files in this folder, all relating to a Catalog containing 16 files that I exported to test Smart Previews. The .lrcat file is the Catalog itself. One .lrdata file contains previews, and the other Smart Previews. Smart Previews are tiny. I exported the original Raw files contained this small Catalog (16 in total) and the total file size was 430Mb. The size of the Smart Previews file is only 9.1Mb. The Smart Previews file is only a little over 2% the size of the Raw files. The compressions is very effective. When I look at a Smart Preview at 100% enlargement in Lightroom, it looks just as good to my eye as the original file. It’s just smaller, as the file has been resized to 2540 pixels along the longest edge. When should you create Smart Previews? If you only ever edit your photos at home, and you always have the hard drive containing your Raw files to hand, there may be no need to build Smart Previews. It takes time for Lightroom to build Smart Previews, and even though they are small, they do take up hard drive space. But if you’re away from home and don’t want to take the hard drive containing the original Raw files with you, then you can build Smart Previews for the photos that you might need. Unlike 1:1 previews (which are much bigger) Lightroom doesn’t discard Smart Previews unless you tell it to. Depending on the total size of your library, you could theoretically generate Smart Previews for your entire photo collection, giving you the ability to edit any of your files in the Develop module while you are away from home. If the figures above hold true, then a library of 50,000 images can be compressed down to a 28GB .lrdata file containing Smart Previews. That’s small enough to store on most internal hard drives. The benefits are not just for travelers. If you’re a laptop user, Smart Previews make it easier to process photos in Lightroom as you don’t need the hard drive containing your original photo files to be attached to your computer. You can take your laptop into another room, to the office, to a friend’s house or a coffee shop and still develop photos. What can you do with Smart Previews? The biggest benefit of Smart Previews is that you can edit your files in the Develop module. When the hard drive containing the original files is disconnected, Lightroom uses the Smart Previews. When you reconnect the hard drive containing the original files, Lightroom updates them automatically. This includes any changes to metadata you may have made, as well as edits made in the Develop module. I’ve tried this out and it works very well. Lightroom accurately transfers edits made using the Spot Removal tool and Adjustment Brush as well as adjustments made using sliders in various panels. Adobe recommends that you check your editing if you have changed the Sharpening settings in the Detail panel, and I guess it is wise to do so if you have adjusted Noise Reduction as well. This is the original Raw file viewed at 1:1 magnification in Lightroom’s Develop module. It is a 21 megapixel file measuring over 5,000 pixels along the longest edge. The red patch over the eye shows the mask created by an Adjustment Brush. This screen shot shows the Smart Preview of the same image, again at 1:1 magnification. The only difference is that the image is smaller. 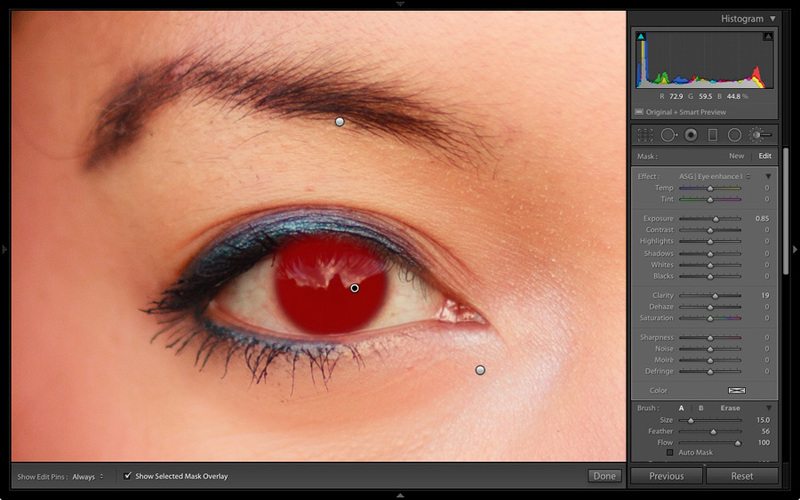 The Adjustment Brush mask has also been resized so that it covers the same area as on the original Raw file. You can also export images from Lightroom. The maximum size you can do so without upsizing is 2540 pixels along the edge, but that’s good enough for most purposes. It’s more than enough for uploading to Facebook, Flickr, 500px, Instagram or your own website (unless you need full-size photos for a specific purpose, such as photo files that may be used for creating prints or sold as stock). If you a professional photographer with clients, it may also be large enough for you to export photo files if a client makes an unexpected request while you are away from home. This size file is large enough for many things, including magazine reproduction at most sizes. Another use I can think of, although I haven’t tested it, is as an emergency backup. As each month goes by, you could export a Catalog containing all the Raw files from that month, plus Smart Previews, and store them offline in Dropbox, Box or a similar cloud storage service. It’s not as good as having the original Raw files, and it doesn’t take the place of a proper backup plan for your Raw files, but it may be some extra peace of mind in the event that a disaster strikes and wipes out all your original files and backups. If you are away from home for some weeks, and have access to the internet, it may also allow you to make an emergency backup of the photos you take during that trip. Smart Previews also allow you to work with Lightroom CC app for mobile, assuming that you have the app installed on a mobile device and that you are subscribed to the Creative Cloud photographers package. The app works with Smart Previews generated by Lightroom for the photo files synced with the mobile device. Smart Previews do have a couple of limitations you should be aware of. If you want to export a photo to a plug-in or to Photoshop you need the original photo file. It won’t work with Smart Previews. If you want to use the Merge to HDR or Merge to Panorama functions, then also need the original photo files. But if you have Lightroom CC 2015.7 /Lightroom 6.7 or later, you can Merge photos with Smart Previews only. There are several ways to generate Smart Previews. When you import photos into Lightroom. 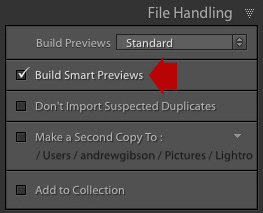 Tick the Build Smart Previews box in the File Handling panel in the Import Window to do so. In the Library module. Select the images for which you need Smart Previews and go to Library > Previews > Build Smart Previews. You can also choose the Discard Smart Previews option if you want to free up some hard drive space or you no longer require them. In the Develop module. Click on the Original Photo icon in the Histogram panel to build a Smart Preview for the selected photo. However, this only lets you build a Smart Preview for one photo at a time. When exporting a Catalog. To export a set of photos as a Catalog, go to File > Export as Catalog and tick the Build / Include Smart Previews box at the bottom of the Export as Catalog window. 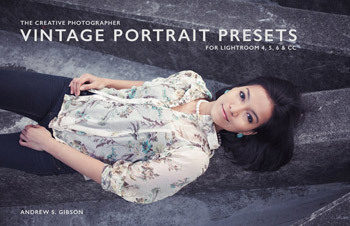 Note that Lightroom needs access to the original photo file to build a Smart Preview. 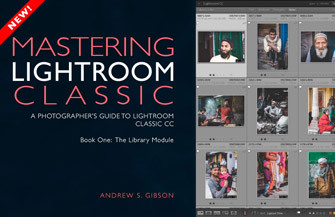 If an image doesn’t have a Smart Preview, and the hard drive containing the original file is disconnected, then Lightroom displays a exclamation mark icon in the Library module thumbnail to let you know that it doesn’t know where the file is. Note that this icon may also mean that the original file has been deleted or moved to another folder outside of Lightroom. If the image has a Smart Preview, then Lightroom displays the Smart Preview icon instead, to let you know that you can process the photo in the Develop module if you need to. 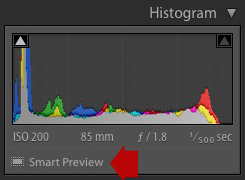 In the Develop module the Histogram panel tells you whether a Smart Preview exists. If it says Original Photo under the histogram, you know that you are processing the original photo file, and that a Smart Preview doesn’t exist. If it says Original + Smart Preview, then you know that you are processing the original photo file, and that a Smart Preview exists (there’s an exception if you are using the latest versions of Lightroom 6 or Lightroom CC – see below). If it says Smart Preview, then that means a Smart Preview exists, and that you are currently processing the Smart Preview, not the original photo file. 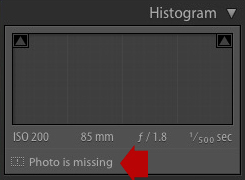 If it says Photo is missing, that means that there’s no Smart Preview, and that the hard drive containing the original photo isn’t connected to the computer (or that the file has been moved and Lightroom doesn’t know where it is). There’s no histogram and you can’t process the image. There’s another benefit of using Smart Previews. It turns out that Lightroom runs faster when editing Smart Previews compared to using the previews it builds for the Develop module. If you take the time to build Smart Previews for your photos, then disconnect your hard drive (it helps if your photos are stored on an external drive) you’ll experience an increase in processing speed. 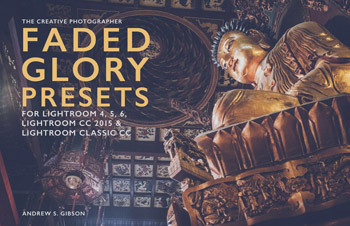 The latest versions of Lightroom 6 and Lightroom Classic have a new feature. You can set Lightroom to automatically use Smart Previews, if they exist, in the Develop module. This even works when the hard drive containing your photo files is connected to the computer. To enable this feature go to the Performance tab in Preferences and tick the Use Smart Previews instead of Originals for image editing box. Then restart Lightroom to make it work. The idea is that working with Smart Previews enables you to work faster in the Develop module. Note that if you zoom to 100% (1:1 mode) in the Develop module, then Lightroom switches to the original file even with Use Smart Previews instead of Originals for image editing enabled. You need Lightroom Classic or Lightroom 6.7 for this to work. Check which version you have by going to Lightroom > About Adobe Photoshop Lightroom (Mac) or Edit > About Adobe Photoshop Lightroom (PC). 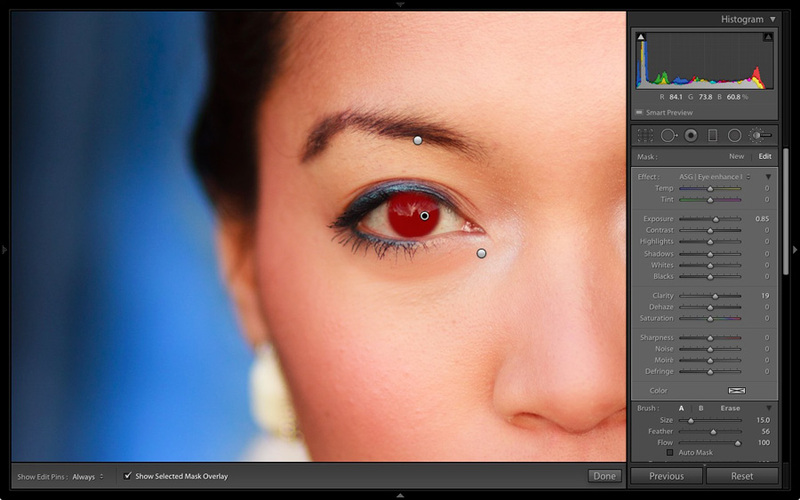 Lightroom’s Smart Previews are a very useful tool that have made Lightroom easier and faster to use. As well as offering speed and convenience, Smart Previews make the Lightroom mobile and Lightroom web tools for CC subscribers possible. 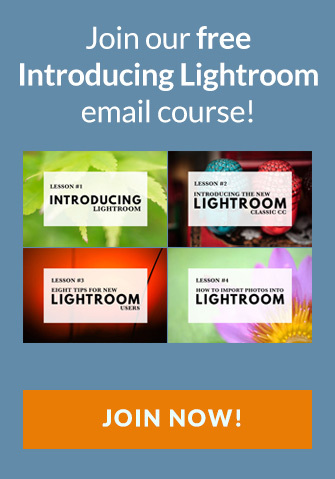 Do you have any questions about Lightroom Smart Previews? Let me know in the comments. This is one of the most comprehensive guides I’ve seen on using Smart Previews. I sometimes forget how useful they can be. Thanks for the reminder. You’re welcome, glad it was helpful. Excellent article and very helpful – thanks! One thing I did not understand. You said “Adobe recommends that you check your editing if you have changed the Sharpening settings in the Detail panel, and I guess it is wise to do so if you have adjusted Noise Reduction as well.” — What do you mean by “check your editing?” And are there limitations to the use of Smart Previews if you modify the Sharpening and Noise Reduction settings before or after using Smart Previews in Develop? You can only truly judge the affect of sharpening or noise reduction at 100% magnification. If you’re editing your photos in the Develop module with Smart Previews only (ie with the hard drive containing your original photo files disconnected) then you can’t view your images at 100% magnification. You can only be certain that your sharpening and noise reduction settings are having the intended effect when you reconnect your hard drive and view the images at 100% magnification. If you have the latest version of Lightroom 6/CC then Lightroom automatically switches to a preview generated from the Raw file when you zoom into 1:1. When you zoom back out again it switches back to the Smart Preview. Thanks, Andrew. So if you opt to always use Smart Previews via the Preferences->Performance tab in the later versions, how/when is the original file updated? Great question, and it’s one I was asking myself until I realized that the original file is never updated. Remember the edits you make are stored in the Catalog as text commands. The Raw file remains untouched and Lightroom shows you a preview created from applying the edits to the file. When you’re in the Develop module using Smart Previews you’re using the Smart Preview rather than a full-size preview generated from the original file. If you zoom in at 1:1 in the Develop module Lightroom switches from the Smart Preview back to the Raw file and creates a preview from that. There’s a delay while it does so, as it needs to add in the edits you’ve made. So I guess you could say this is when Lightroom updates the preview generated from the original file. So the question really is what preview are you looking at? In the Develop module it’s either the Smart Preview or a preview generated from the original Raw file (at 1:1 magnification only). In the Library module it’s either a Standard preview (if it exists) or, if you zoom into 1:1, a 1:1 preview. My goal is to be able to edit photos in LR on my laptop when away from home using Dropbox as a conduit for my catalog. Is it possible to do this without building Smart Previews on the laptop? The catalog opens up on my laptop but no images, ie no Smart Previews. Since it appears Smart Previews are backed up in the catalog why do they not open on my laptop? Is the only alternative to build smart previews on the laptop and if so would there be any use for Dropbox in this scenerio? Previews (both Smart Previews and the 1:1/Standard/Minimal previews that Lightroom builds so you can see your photos in the Library module) are saved in separate file to the Catalog itself. Copy those to Dropbox along with your Catalog and it will work. It’s possible to use Dropbox to enable both your main computer and laptop to use the same Catalog. For this to work, you need to make your Dropbox folder the permanent home of your Catalog, not just move it there when you want to use your laptop. You also need to be aware of syncing issues. For example, if you use your laptop in a location without wi-fi, you need to make sure it is connected to the internet and has been able to upload the updated Catalog files to the Dropbox servers before you open Lightroom on your main computer. It’s also important to understand that you need access to either your original photo files or Smart Previews to develop your photos in Lightroom. Smart Previews are easier because they are much smaller. Another option that may work for you depending on how often you use Lightroom on your laptop is to export a Catalog containing the photos you want to Develop on your laptop while you are away. You can copy the new Catalog onto your laptop, then copy it back to your main computer and merge it with your main Catalog when you get back. This assumes you don’t need to access every photo in your Catalog while you’re away, just some of them. Hope that makes sense, let me know if you have any questions. Lets assume that I have 2 people that needs to work in the same catalog in remote places. Person 1 import the original images and makes al lens corrections and HDR. Person 2 supposed to be doing all the color corrections and other editing. I got part 1 perfectly working and now my problem begins. I have tried to create the smart previews and do al the person 1 stuff and afterwards I tried to share the smart previews with person 2 but it doesn’t work. Than I tried to export as a new catalog just with the images that I want, not including original RAW images (smart previews only). The catalog opens ok and changes are made. When the person 2 send the catalog back with the changes, I try to reimport the catalog and nothing happens, the original files are not synced and basically I have to do all the work again. I know that this is not a new function and I may be doing something terribly wrong because I can’t make it work, I can’t find anyone anywhere that actually explains how this is done in a step by step way, without assuming that everyone is an freaking expert in Lightroom so I end up with lots of praise about how great it is to share the work flow and blablabla but all I could find are posts in blogs and sites where appears to me that everyone that is trying to do what I’m trying to do can’t make it happen except the super experts. I finally found your site in one of these blogs and so far you appear to be the only one that is making more sense about how this should be done.. BUT…here I’m again… when I was thinking that I finally found the answer to my problems you stopped the topic and i got stuff on step one and totally lost. My biggest challenge is that my wife runs a Real Estate photography business and as you may imagine she alone shoots about 20 houses per week not counting the rest of the team so we have huge amounts of images everyday and we want to hire a few editors remotely but due to the tremendous amounts of images we have the process always takes forever. 1. do you have a book that I can purchase that explain this freaking process step by step in a simple and non-expert language? 2. If you don’t have the book, can I pay you to give me a one-on-one training to reproduce this process from scratch with 2 or 3 pictures to make it quick and simple so I can replicate it on the real jobs? How can I share the freaking LR catalog via smart previews with other people/editors and once I receive the work back, how do I reload the previews in the original catalog and sync al the changes made to the original files. (I can’t export from the smart previews because all of our clients use the photos to produce high quality printed brochures so I need the images in 300DPI and at least 7k pixels wide – at client’s request). If you can help me by selling the book or a direct consultation or even if you can refer someone that could provide me a quick Skype training I will be the happiest man alive. At this stage I’m so frustrated that I have no idea what to do anymore. Thank you very much for your attention and congratulations on your work. Hi Alex, great question. Let me think about it and try out a solution and I’ll get back to you in a day or two. I tested out your workflow and got it to work. Here are the steps. I suspect you may be going wrong at the last stage – importing the photos back into the first Catalog. It seems the most likely place as there are several settings to get right. Give this a try and see if it works. 1. First user makes a Collection containing the images to be developed. 2. First user makes lens corrections etc to photos. 3. First user goes to File > Export as Catalog. Untick the export negative files box. Tick the Build/include Smart Previews and Include available previews boxes. 4. First user sends folder containing Catalog and previews to second user. 5. Second user opens the exported Catalog (which contains Smart Previews but now Raw files) and retouches photos. 6. 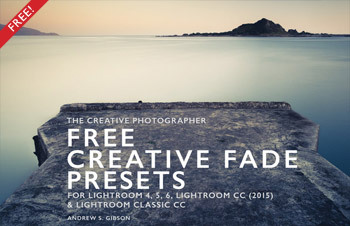 Second user quits Lightroom and sends Catalog folder back to first user. 7. First user imports photos into Catalog. These are the important settings.Tick Show Preview box. Set Replace to Metadata and develop settings only. Make sure all photos are ticked (use the Check All button). Click Import button. 8. Lightroom imports the retouched photos into the first user’s Catalog and updates the photos with whatever was done by the second user. It appears Adobe snuck in a change at some point. You can now edit images even when the original is offline and there is no smart preview available. I guess it’s just using the regular preview file. You’re right! That’s very interesting, I hadn’t noticed. It looks like they are using one of the Library module previews. The preview quality isn’t great, but I guess the idea is to let people develop their photos even if the hard drive they are saved on is disconnected and they haven’t created Smart Previews. Is it possible to send smart previews to someone else to be edited? (Obviously in LR) And then ultimately returned to me, to view the changes in LR and then export to Jpg’s? Hi Brian, yes, it is and it’s quite easy. Select the photos that you want to send to somebody else and go to File > Export as Catalog. At the bottom of the Export as Catalog window tick the Export selected photos only, Build / Include Smart Previews and Include available previews boxes. Leave the Export negative files box unticked. Lightroom exports a new Catalog which you can send to somebody else who can open it and develop the photos. When they send it back to you go to File > Import from another Catalog and follow the instructions. Andrew, thank you for taking the time to respond, greatly appreciated! Seems like a simple process, yet I had a hard time finding instructions on how to do this! You’re welcome – I’ve added it to the list of article topics to cover. You’re not the only reader who has asked me this. Is there a way to increase the quality of a smart preview? Like being able to see 1:1? Would that just be the same thing creating a 1:1 preview? Hi Simon, no there isn’t, at least not in the sense you mean. A Smart Preview measures 2540 pixels along the longest edge. You can view that at 100%, and it gives you very good detail, but it’s not the same as a 1:1 preview. If your photos measure say, 5000 pixels along the longest edge, then the Smart Preview is a little over a quarter the size of a 1:1 preview. Hope that makes sense. This article was really helpful. I do have a question tho. If I edit an entire wedding using smart previews as the processing is faster and I want to export the files to be used for whatever size printing the client desires, is that possible if I just attach the external drive containing these images? I’m unsure of where the merge happens to make this action possible. Great question! You can actually export images without the external hard drive, just using Smart Previews. The only limitation is that the maximum file size is 2540 pixels along the longest edge (the same size as the Smart Preview). If you need larger files, simply connect your hard drive. Lightroom can export full-size photos whenever the hard drive is connected. In answer to the second part of your question, there is no merge as such. 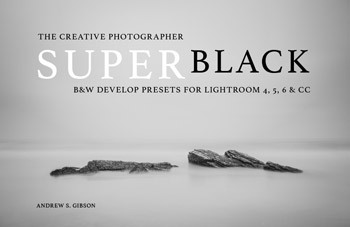 What happens is that Lightroom records all the developing work you have done to your photos in the Catalog. The process is identical whether Lightroom is using Smart Previews or regular Develop module previews to display your photos. In theory, if your photos have Smart Previews you never need to connect your external hard drive again. The only exception is for exporting full-size images. Hi! So I think I’m kind of grasping this…so this is what I’m hoping to do with LR CC and potentially smart previews…I want a be able to edit at home, and my office without having to drag hard drives around. How is the best way to accomplish this? Basically for the scenarios like start editing in LR at the office, up against a deadline and crap have to finish at home. Is there a cloud based way to do this? And what are creative cloud files good for? Hi Jody. This is the quickest and easiest solution. Select the photos you want to work on at home and go to File > Export as Catalog. At the bottom of the Export as Catalog window you’ll see some boxes to tick. Tick the Build / Include Smart Previews and Include available previews boxes. Leave the others unticked. Then select a folder to save the Catalog to on your computer. If you want a cloud based solution then save it to a Dropbox or Google Drive folder and make sure you give it enough time to upload. Otherwise, you can save it to a flash drive (smaller and easier to take home than a hard drive). At home just open the Catalog and continue with your work. When you get back to the office go to File > Import from another Catalog and follow the instrutions. Another option that might work for you is to synchronize the Collection/s containing the photos that you’re working on (again you have to allow enough time for the sync process to complete) and work on them at home on Lightroom mobile on a tablet. 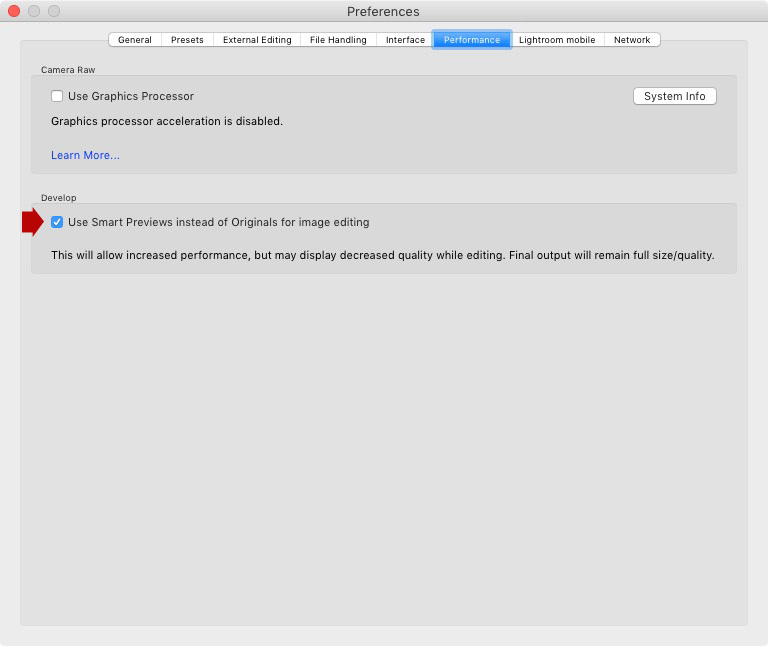 This is where the Creative Cloud aspect of Lightroom CC comes in (syncing Smart Previews). So I was given a smart preview catalog (Wedding Smart Previews.lrdata) via dropbox which I downloaded onto the computer. However, when in Lightroom and I try open the catalog it is greyed out. When I go to the catalog on the desktop where it is saved and open it there, it opens up Lightroom and all the images but it is asking me to import the images. I am unsure what has happened and why I cannot just open the catalog and continue editing the images? Also, none of the previously edited images are in the catalog. What went gone wrong and what should we do?? Hi Grace, the file you have contains the Smart Previews but not the Catalog itself. You need the .lrcat file as well as the Smart Preview file. The two go together, and one won’t work without the other. Does that help? Hi Andrew. Thank you so much for the feedback, it does help thank you! Hi Grace. You are right, the photographer won’t be able to open the Catalog in Lightroom 5 after you’ve upgraded it. The simplest solution is for her to upgrade to Lightroom Classic CC as well. Another solution would be for you to use Lightroom 5 yourself for editing her photos, if you have a valid Lightroom 5 license you can use. You can probably set up a somewhat convoluted workflow where you save the Lightroom data in a sidecar (xmp) file that you save alongside the Raw files and she can then re-import those photos back into Lightroom 5. The danger here is that you do something in Lightroom Classic that doesn’t exist in Lightroom 5, such as apply the Dehaze filter. Another option – and this depends on your workflow and whether she needs Raw files from you – is to simply export the photos you edit as JPEG or TIFF files and send them to her rather than a Catalog. Hopefully there is something amongst all those suggestions that helps! Hi Waleed, if you have Lightroom Classic CC you can try importing the photos with Build Previews set to Embedded & Sidecar and the Build Smart Previews box unticked. 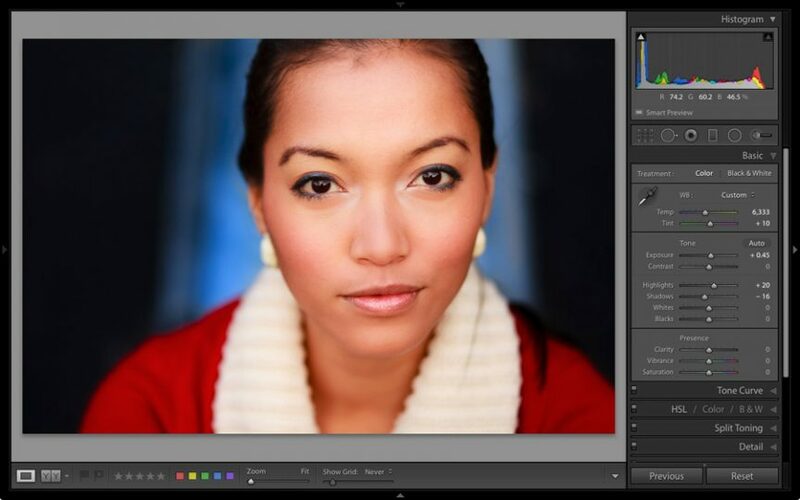 This gives you the quickest possible import in Lightroom. Then you can look through your photos and Flag the ones you want to use for your client. Send those to a new Collection and build Smart Previews for those photos. It won’t take long and then you can work on them in the Develop module. An alternative is to use Photo Mechanic for the initial culling and then send just the photos you want to Develop to Lightroom. Many photographers who need to work quickly use the two applications together this way. Great article but I have an issue that I can not figure out and I’m hoping that you an help me. I have been struggling with this issue for a while and have read many posts about it but I’m still not sure what to do. I am working on a MacBook Pro. The hard drive is 500GB’s. I am using LR 6.14. All of my original RAW files are on an external drive. When I import images into LR, I create smart previews so that I can edit without having the external drive attached. I currently have 140,839 photos in LR. I have the 1:1 previews set to delete after 30 days. The “Lightroom Catalog Previews.lrdata” file is 65.31 GB’s. The “Lightroom Catalog Smart Previews.lrdata” file is 136.42GB’s. The Lightroom Catalog.lrcat” file is 2.21 GB’s. Here’s my problem. All of the catalogs listed above are taking up over 200GB’s of space on my computer. Is there any way for me to decrease the size of these files? I am always deleting pictures from LR and before I delete them, I go to “Library” “Previews” “Discard 1:1 Previews” and then I do “Library” “Previews” “Discard Smart Previews”. The white progress bar displays to show that it is working to delete the previews. Then I go to “Photo” “Delete Rejected Photos” and I delete them from the disk, which is the external drive. I just did this process again with 1,578 photos but the size of the “Lightroom Catalog Smart Previews.lrdata” file did not decrease at all. Is there anything that can be done to decrease these files? As far as I understand, I need to keep these libraries on my computer so that I can use LR when the external drive is not attached. Is there any solution at all? Thank you in advance for all your help and ideas. Hi Mike, it sounds like you are doing the right thing to reduce the size of your preview files. The key point you need to understand is that when you tell Lightroom to discard 1:1 or Smart Previews it doesn’t delete them from your hard drive right away. It holds onto them in case you use Undo to bring the discarded 1:1 / Smart Previews back. It seems to take a day or so before Lightroom acutally deletes the previews, which is why you don’t see an immediate change in file size. The best way to get those file sizes down is delete as many 1:1 and Smart Previews as you can, especially the 1:1 Previews. Smart Previews are small but the size still adds up when you have a large amount of photos! Hi Marty, you don’t need the Raw files to export from a Smart Preview. You can export JPEGs from Lightroom up to a maximum size of 2540 pixels along the longest edge (as that’s the size of the Smart Preview). The plugin you linked to is for extracting JPEG files from the other previews used in Lightroom, like 1:1 previews or full-size previews created by Lightroom for the Develop module. Thanks for your article and being so incredibly responsive in the comments. My question is similar to Linda P (Feb 3, 2017) and Alex (June 4, 2017), but different enough that I’d like to ask. I work at a tour company with a modest photo collection (~200gb or so), with regular but small additions during the summer months and occasional larger imports when we have a pro photographer join a trip. There are 2-3 of us in the office that may access photos for different purposes. We’re often not in the same office (or same country), so I’m struggling to be able to find a way for us all to access the images. We use Google Drive for most files (synced to local folders on each computer) and could do this for photos as well, but with my understanding of how LR and smart previews works so far it doesn’t seem like it would work well. It seems that whether we store all images, catalogue and previews on Google Drive or keep original images on an external drive in the office, and share only the smart previews, there are a couple of issues. Problem 1: The file path for the Drive folder on each person’s computer will be slightly different (Macintosh HD > users > mycomputer > Google Drive, vs Macintosh HD > users > colleaguecomputer > Google Drive), thereby confusing the LR catalogue. Do you know if I can tell LR to use two (or more) different file paths for the catalogue to overcome problem 1? Is there another solution you would recommend? I really like LR as a management tool, so if we’re able to use it that would be amazing. Hi again, I’ve just solved my problem #1 (the file path issue) – just move the Google Drive folder! I assumed it had to be in its default place, but if all of us that want to share the catalogue simply move the folder up one level, then all file paths should be the same (Mac HD > Users > Google Drive) and the catalogue should work across all our machines. Problem #2 remains, even if we forgo the smart previews and only end up syncing the catalogue (a large enough file in its own right)… I’m open to suggestions you may have. Keep a Lightroom catalog on cloud storage such as Dropbox (with cloud storage client installed on each computer), while storing photographs on an internal/external drive or a network share. Requires reliable and high-speed Internet connection when syncing. Dropbox only does incremental copy, which means that newly added data can be synchronized somewhat quickly between computers. However, one needs to make sure that Dropbox is set up to only synchronize the Lightroom catalog (image previews should be excluded via “Selective Sync” feature on all computers). This solution can work relatively well, but there is a risk of having inconsistent data. Each machine writes its own data into the cloud and if the catalog is not fully synchronized between the cloud and the machines (due to slow Internet or Internet service issues), there is a risk of potentially losing data or changes to the catalog file. You must wait for synchronization to complete on all machines (upload and download) after closing Lightroom before opening the same catalog on another one. 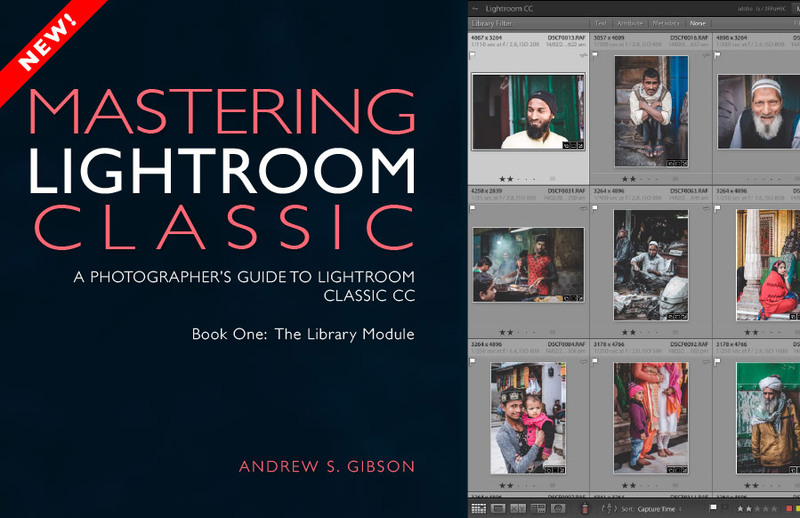 I wonder if the best approach is to use Lightroom CC? It’s not as fully featured as Lightroom Classic but as long as it does all you need it could work. With Lightroom CC everybody would need to be signed in with the same account to access the photos and there is far less likely to be any syncing issues. My workflow has been to keyword RAW files in Bridge. I have a permanent keyword list there that I choose from. Then I import the RAW files into LightRoom. Sometimes I later change the metadata in Bridge. Before Smart Previews an arrow let me know that I had made a change in Bridge and could “import metadata from disk into LR”. With Smart Previews, I have no way to know if metadata in LR needs to be updated from Bridge. Is there any way with Smart Previews to get indication that metadata needs updating from Bridge? And any way to update from Bridge to LR? Hi Elinor, are you referring to the fact that Lightroom doesn’t display a Metadata has conflict icon if the hard drive containing the original photos isn’t connected to the computer? If so the simplest option is to reconnect the hard drive. Another way to find photos with metadata conflicts is with a Smart Collection. Set the rule to Metadata Status is Conflict Detected. Hope that helps! Actually I had the external drive connected the whole time. The missing photo number has gone way down. Just haven’t checked that out yet. I think I may have my initial questions worked out. But I do have a couple more questions as I’m importing photos. Why do some that had a conflict with the color work space refuse to import? I opened them, set the correct color work space and saved. Quit Light Room. Opened it again and tried to import again but no luck. Also what does it mean to have the file name black on the thumbnail and the same file name in gray? I have a screen shot but don’t think it will send. I’ve never heard of a conflict with color space affecting the import of a photo. Which program are you setting the color work space in? The color workspace is set in Photo Shop. The article was very helpful. So now the problem is that in the left panel in Folders, LR adds a number to the name of my external hard drive from LaCie 1 to LaCie 1 1 and up the sequence (has gone up to LaCie 1 12) every time I use the Library. So with LaCie 1 connected, LR says photos can’t be found. I have not changed the name of the external, LR does that in the Folder list. It appears that my only recourse is to uninstall and reinstall LR. Hi Elinor, I don’t know why Lightroom is renaming your hard drive but uninstalling and reinstalling Lightroom isn’t the answer (I Googled it and couldn’t find anything useful). All you have to do is go to the Folders panel right-click on one of the Folder names and select Find Missing Folder. You can then navigate to the folder location on the hard drive and select it. Lightroom will update all the other Folders at the same time. Thanks for this! Quick question – if I create smart previews for a whole catalogue, and Lighroom Synching is switched on, does that mean I have access to all those photos on my Lightroom MObile app? Hi Alena, yes you do, as long as you add them to Collections and sync those Collections with Lightroom mobile. You can sync a Collection by ticking the small box that appears to the left of each Collection name in the Collections panel. It will take a long time to sync your entire Catalog if you have a lot of photos in it! Hi Cecilia, I just realised I never answered this question. Sorry about that. In short, when you import your Raw files into Lightroom you have the option to convert them to DNG. If you don’t do that, then Lightroom doesn’t do anything to the Raw files. After you’ve developed your photos you can create JPEGs using the Export option. Exporting photos creates copies and you don’t lose your original Raw files. Hey, great article. Do Smart Previews ever expire? Can I set a time for them to expire? Hi James, Smart Previews don’t expire. You can delete them manually by selecting photos and going to Library > Previews > Discard Smart Previews. I may have gotten myself into a predicament. I imported photos from a memory card that was backed up to 2 external hard drives and created the smart previews from that memory card. I have since formatted that memory card thinking that I would just relink to the files from the external hard drive. Since smart previews do not relink and I have already edited many hours worth of photos, is there any way I can link up those files from the hard drive with the smart previews I have edited in order to be able to export a full size picture? I understand that they do not link up per say at a specific time, but how could I get that full size photo without having the original memory card that built the previews? Thank you sooo much if you can help! Hi Joshua, what do you mean when you say that smart previews don’t relink? It sounds like you imported photos from your memory card, then deleted them. So now Lightroom doesn’t know where to find those photos. But you have copies saved on external hard drives. As long as you haven’t changed the filenames it should be simple. Go to the Folders panel, find the folder/s containing the missing photos, right-click on the folder name, select Find Missing Folder, then navigate to the folder containing the copies and select it. Should be fairly straightforward. 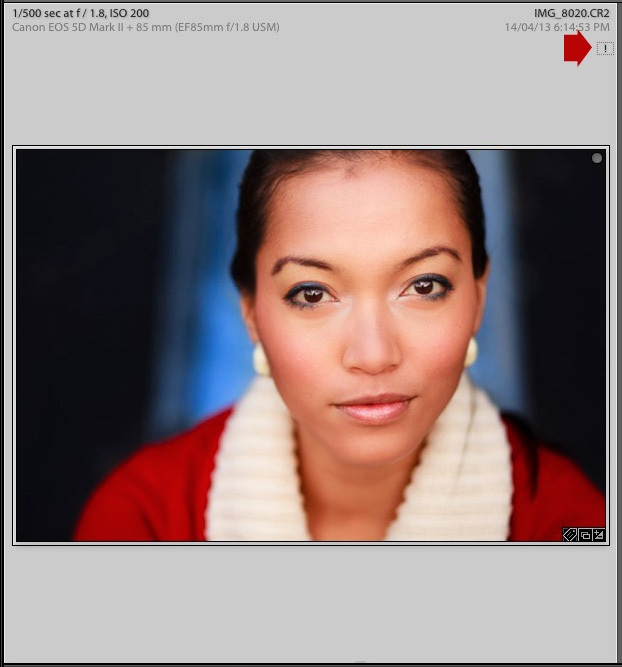 So… lr cc users are using smart previews to edit and their photos are “safe” in the cc. Besides the few BUT important features that need the original files…..and besides the we’ve always done it that way hear…… why not give lr classic cc users the ability just like lr cc users to keep it all in the cloud ….. with the ability to save selected photos locally? OR…. how do I use lr classic cc like lr cc users do? Hi Dave, uploading your photos to Adobe’s servers isn’t practical for most photographers because if you have lots of photos then it will take months to upload them all. There’s no workflow advantages to working with photos in the cloud, Smart Previews are a much more elegant and practical solution. If you’re thinking of using cloud storage as backup, then BackBlaze is a better solution. It works well and backs up all your document files, not just photos. Hope that helps! Just a comment from my experience with recent Lightroom 2019. I stored a temporary catalogue on Creative Cloud folder as every computer will have this folder. I could then access the smart preview from any computer I am editing on. The drawback to this is that Lightroom goes mental if both the computers are connected and CC is on. It tried to create a lock file, but I guess that doesn’t work so well. So one workaround I discovered is to close the creative cloud and Lightroom on the computer you are not using. And later turn it on. This solution will not work if two people are editing at the same time on two different computers. Hope this helps someone.